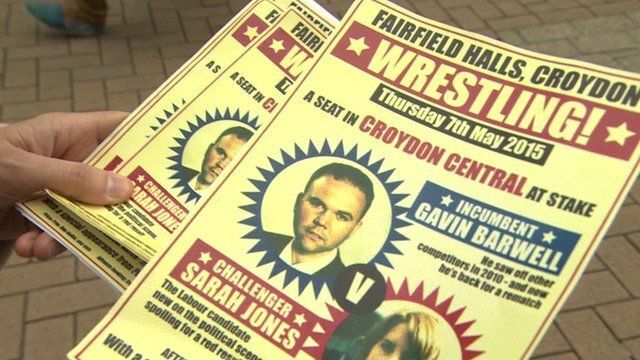 Politicians battle for Croydon seat Jump to media player As part of a series Every Vote Counts, BBC London looks at some of the key election battlegrounds being fought in the capital. Taking the pulse of London's health Jump to media player BBC London's Karl Mercer looks at the state of the health service in London going into the 2015 General Election. Ealing is key election battleground Jump to media player Ealing Central and Acton is one of about 20 seats in London that could shape the outcome of the election. Croydon Central is likely to be one of the most closely fought seats in London in the 2015 election. Labour needs a swing of 2.9% to remove the Conservatives, who won the seat from Labour in 2005. BBC London is looking at some of the key battlegrounds being fought in the capital as part of the Every Vote Counts series. BBC London's Katharine Carpenter spoke to Conservative candidate Gavin Barwell, Labour candidate Sarah Jones and UKIP candidate Peter Staveley. April Ashley Trade Unionist and Socialist Coalition Gavin Barwell Conservative Party Sarah Jones Labour Party James RobertFearnley Liberal Democrats Peter Staveley UK Independence Party (UKIP) Esther Sutton Green Party Martin Camden The UK Progressive Democracy Party.